We’ve posted in the past about why it’s critically important to have a will, especially if you’ve acquired any substantial assets or have children, a spouse, or family members who are dependent on you. The recent death of musician Prince provides an object lesson on how dying without a will (known as dying “intestate”) can present a long and expensive court battle for the deceased person’s heirs. The news of Prince’s death at the young age of 57 came as a great shock to his legions of fans. Presenting almost as great a shock to legal experts and estate planning attorneys was the fact that the mega-successful musician, a famously sharp businessman who was legendarily protective of the legal rights to his music, died without a will. Prince also died unmarried and without children, which potentially makes the division of his estate even more complicated, based on rules governing inheritance in the absence of a will. Shortly after his death Prince’s sister, Tyka Nelson, filed a petition in Minnesota state court requesting the appointment of a special administrator, stating in her petition that she was unaware of the existence of a will or any trusts. The laws of Prince’s home state, Minnesota, stipulate that half siblings are to be treated as full siblings under the rules of intestate succession (i.e., the rules governing who gets your stuff if you die without a will). While Tyka Nelson is Prince’s only full sibling, he had five half-siblings, and in the face of reports estimating the value of Prince’s estate at $300 million, it seems highly possible that yet more relatives will emerge before the estate is fully distributed. Not only is the absence of a will problematic, but for an estate like Prince’s, the absence of a personal representative or executor tasked with handling the liquidation of Prince’s assets will make the process even more arduous and possibly less in line with what Prince would’ve wanted. Prince had stockpiled hundreds of unreleased songs and is still a well-selling artist who had his own recording label and a large home near Minneapolis. 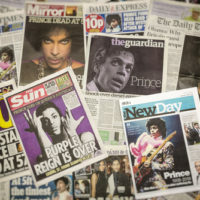 Handling his ongoing business affairs and the distribution of his music without direct instruction from Prince himself could lead to drawn-out court battles. One expert stated that he wouldn’t be surprised if Prince’s estate were still in probate 20 years from now. If you or a parent are in need of legal help in creating an estate plan, allowing you to rest easy knowing that your heirs will be taken care of and your charitable interests provided for after you go, seek out experienced, thoughtful wills and trusts attorneys by contacting the Hudson Valley estate planning law firm Rusk, Wadlin, Heppner & Martuscello for a consultation, in Kingston at 845-331-4100, or in Marlboro at 845-236-4411.